Here is a cute bird card for most occasions. It is an interactive card, fun and colorful. For the bird, I used watercolor. For the background, I used water with distress ink and a stencil. The best part of this is that the birdie will shake when you touch it. It includes a spring which allows it to have the cutest wobble. I made a quick tip video tutorial, showing each technique for this little fella. HLS April 2017 Watercolour Challenge ~ twist "Rainbow"
Supplies: Unity Stamp Co. Do Your Thing Birdie, Ranger distress markers, MFT dies and stencil, Lil' Inker Designs die, Action Wobble spring and paint brush. Here is a card for almost any occasion which would make someone's day. Sentiment: Girl, you truly make a difference in this world. For this card, I used a mix of patterned paper, stamping, watercolor and die-cuts. I paper pieced the butterflies and popped them up for a floating look. I made a quick tip video tutorial on making your own embellishments. Supplies: Unity Stamp Co. Whatever Comes Next, Girl Truly and Moment By Moment; Spellbinders dies, Ranger distress markers and Pop Dots. Here is an embossed miss you handmade card with flowers. Sentiment: I miss seeing you. I miss seeing my mama, talking to her, laughing with her, listening to her stories and her love, more every day. The flowers and sentiment are heat embossed. There are lots of die-cut pieces in this, made from paper punches. I have a quick tip video tutorial for this card showing paper punch accents. Unity is having a sale this weekend. They are giving away this flower stamp kit away free with a qualifying purchase. 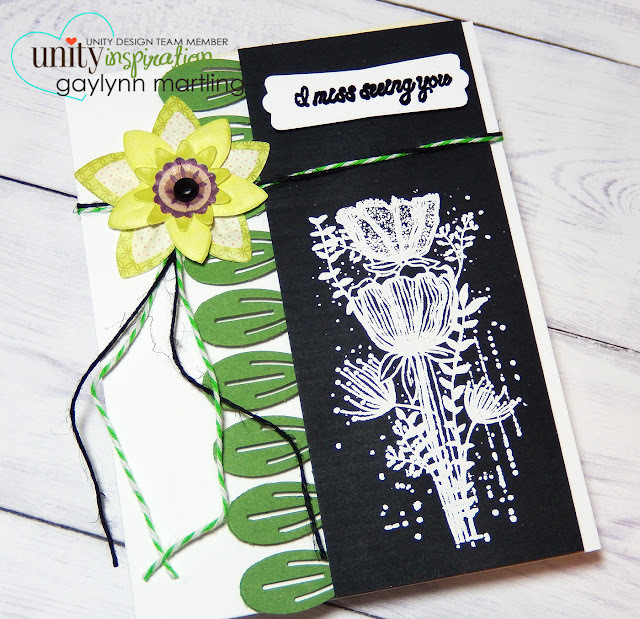 Supplies: Unity Stamp Co. Whispy Prairie, embossing powder, VersaMark ink, paper punches, flower brad and twine. My whole heart gives thanks card. My heart is full of thanks for wonderful people who have seen my family and I though challenging times the past several months. Sentiment: My whole heart gives thanks. It really does, now more than ever. This card can be for Autumn, Thanksgiving or a genuine thank you. For these big and beautiful leaves, I added bold Autumn colors to go with the bold artsy sentiment. Supplies: Unity Beautiful Change Layers of Life stamps, Copic markers, Avery Elle dies, MFT dies. Today, I am on the Unity blog with this project for Kit of the Month Monday. Sentiment: Just like flowers, some people brighten your day just by being there. For this card, I accented with gold foil, using an adhesive pen, gold foil and a laminating machine. I selected a few tiny areas to shine with this technique. The foil will shine when the light is just right, and then other times it will not be as shiny. With movement it sparkles. Here is a picture of it out of the direct light. The gold is there, just so difficult to photograph. 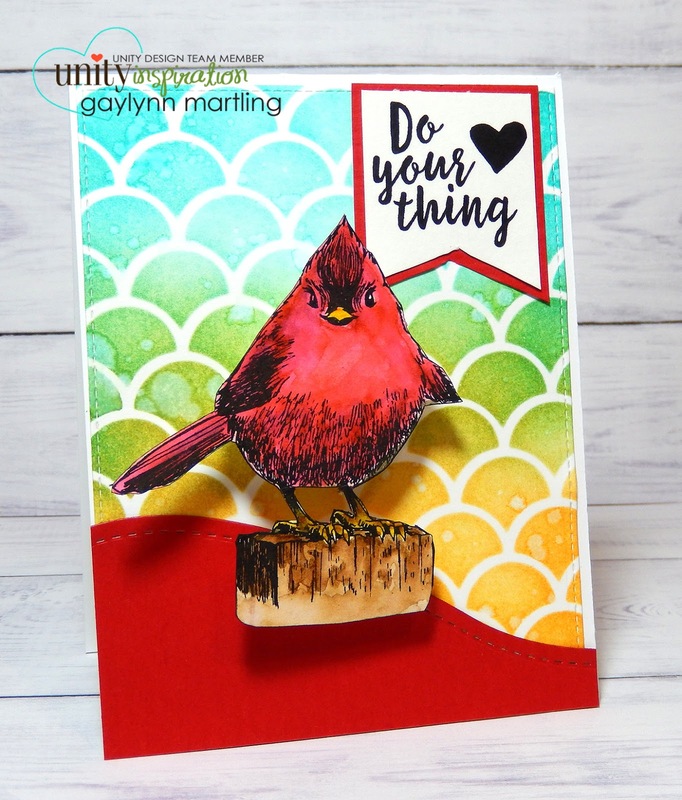 Supplies: Unity Stamp Co. Be My Bird Kit of the Month, Winnie and Walter dies, Ranger archival ink, Copic markers, foam tape, Tim Holtz distress ink, Therm-o-Web Deco foil adhesive pen and gold transfer sheets and Yourstory laminating machine. Today, I am sharing another post with my bible journal. This one features stamping and watercolor with chalk inks. Sentiment: Have faith in yourself. This is another experiment using art in my bible journal. I have a few posts about my search for the best ways to make my pages pretty without destroying the words on the page and preventing the inks from bleeding though to the back side of the page. You can find more of my posts like this one, by clicking on bible journal. On this page, I used stamps with chalk ink for the images and also watercolor with chalk ink. 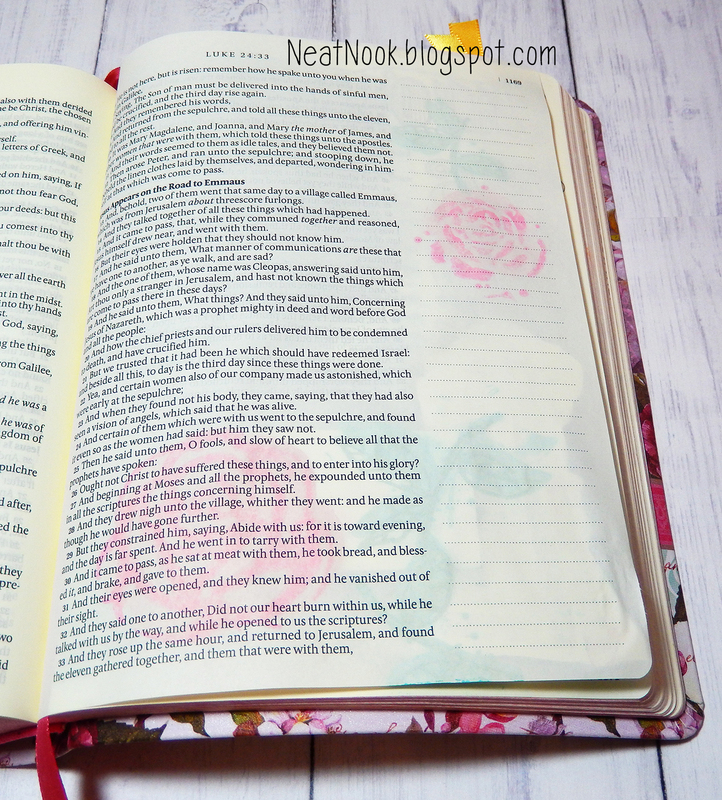 I think, for bible journal art, the chalk inks are my favorite so far, with both stamping and watercolor on the thin pages. The best part, there is no bleed through. You do see a slight shadow of the image on the back side, but nothing like other inks which bleed all the way through the page and sometimes pages. As watercolor, these inks blend smoothly and leave a soft look. I have successfully done both watercolor direct to page and also watercolor onto separate journal panels with these chalk inks. So far, I have not used gel medium in the bible. But, I would like to try that soon. Here is a quick tip video tutorial showing the stamps and inks used together for stamping and watercolor. Supplies: Unity Stamp Co. Cecelia Girl, Keep Going Anyway and You Are This; My Creative Bible, Canson watercolor paper, Prima chalk edgers ink and Lil' Inker Design dies. Today, I am sharing an adorable Easter card, made with a mix of four different stamp kits used on the front and on the inside. I really love this frame of flowers, and the sweet bunny. So, I put them together in this project. I have a quick tip video tutorial sharing ways to mix different stamp kits as well as centering die-cuts using an edge punch tool. The inside of the card is shown in the video as well. Supplies: Unity Stamp Co. 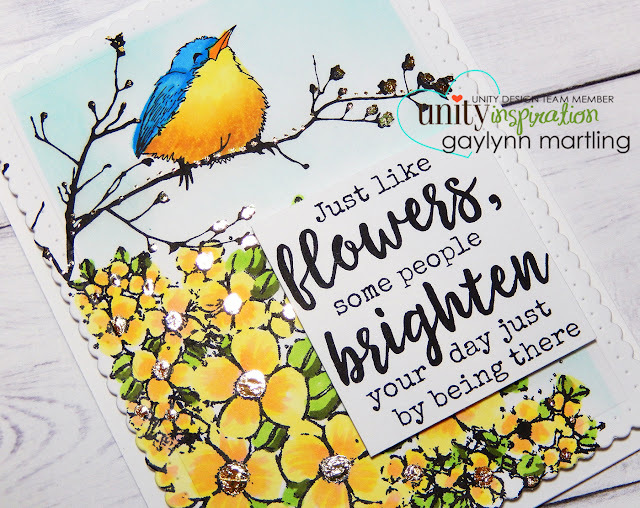 Pretty Darn Amazing, Let's Be Happy, Mama Owl and Be My Bird kit of the month; Copic markers, Winnie and Walter dies, Pretty Pink Posh sequins, craft punch and Ranger archival ink. Hi, it's Gaylynn here. Today, the Unity Stamp Co. design team is hopping and showcasing amazing projects with the newest release. Behind you all your memories, before you all your dreams, around you all who love you, within you all you need. There is a grad guy and girl released, so the images can be switched to suit the recipient. I especially love this sentiment. My baby girl is graduating college, and this card is going to her. I used watercolor paints on this girl. Here is a quick tip video tutorial for this grad card. I made a masculine grad card similar to this one, on another post. 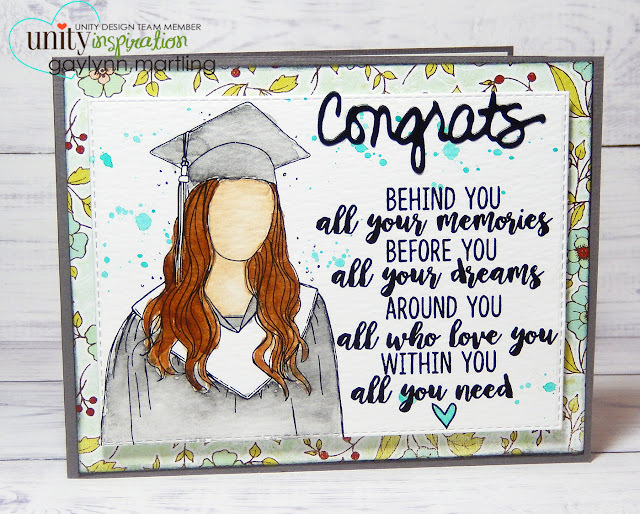 Supplies: Unity Stamp Co. Graduation Wishes and Sentiments for Graduates, Sakura Koi watercolors, Ranger arhival ink, Ranger watercolor paper and My Creative Time dies. 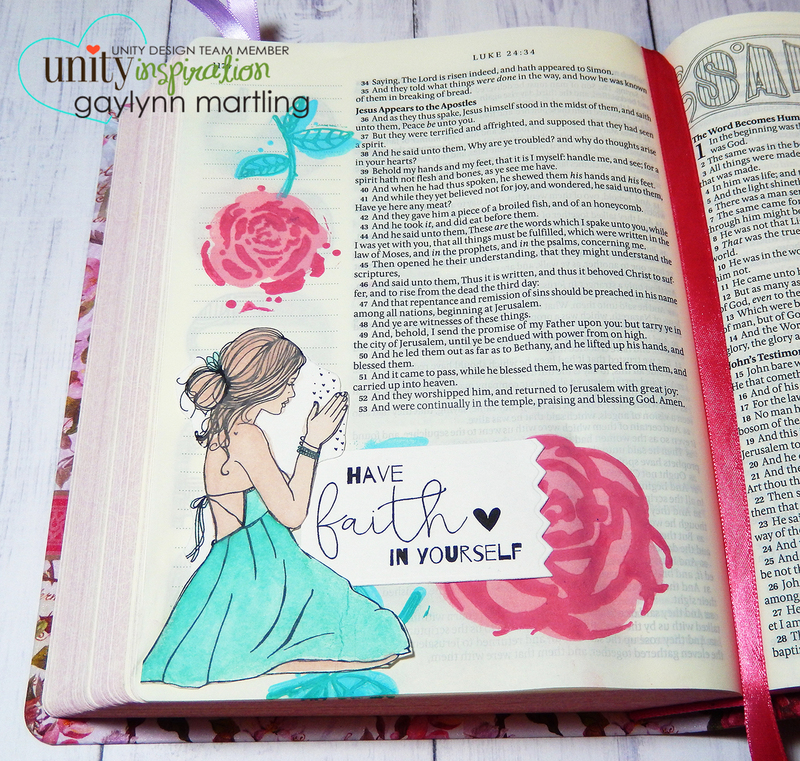 Today, I am up on the Unity blog with an Inspiration Wednesday post. I decided to make an inspirational mixed media canvas. This mixed media canvas was inspired by my fellow design team member Camille. I love her artsy style and techniques. I used acrylic with stamping for this 5"x7" canvas, adding texture along the way. Supplies: Unity Stamp Co. 3/2017 SMAK Let Go and Breathe, Liquitex acrylic paint, Mod Podge, Gesso, tissue paper, Winsor & Newton stretched cotton Artists' Canvas, hot glue, brads and gems. The past few weeks have been a whirlwind. I have so many people to thank. Here is just one token of thanks. Wish I could do more to show my gratitude. Sentiment: Thank you for thinking of me. This is a beautiful flower bouquet, stamped in multiples and with watercolor in the center section only. Sometimes, less is more. I made a quick tip video of the process, using watercolor pencils. Supplies: Unity Stamp Co. Girl Truly, Derwent Inktense watercolor pencils, paint brushes, Ranger archival ink & watercolor paper, MFT dies, gems and foam tape.